I love this series! I’ve read so many mysteries, it’s hard to get excited about a new one, but Davisson’s feels fresh- I really liked McKenna and care what happens to her. In the first book SHATTERED: Logan Book 1, Logan, a woman in her 40’s has recently lost her husband, her job, and her illusions about the world. She may be down, but she’s not out. She’s strong and Davisson does a great job making her real. I live in Southern California, and enjoyed the Arts Festival, eclectic characters, and beach walks. 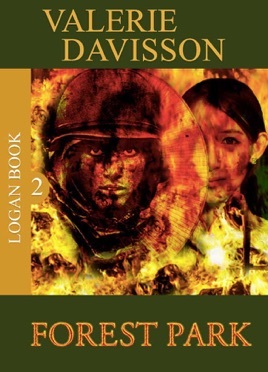 The great character development, deftly woven plot and dialogue continues in this book, FOREST PARK, the second in the Logan series. I love her sense of place-this time the action is up in Portland, Oregon, although she comes home to Jasper, where, according to her author page, the third book will take place. This book ramps up the action, but still keeps the excellent character development and kept me turning pages. Without being preachy, she highlights real issues like homeless vets, immigration, letting go, and the rocky path of of love she is not even sure she wants to walk again. Logan has a grown daughter working in Africa, a complicated relationship with her neighbor, Ben, and is creating a new life for herself in an ever-changing, dynamic world. I can’t wait to read book 3!